This post is courtesy of our contributor Deanna…With Halloween a few weeks away I thought it would be fun to try something I have yet to see. 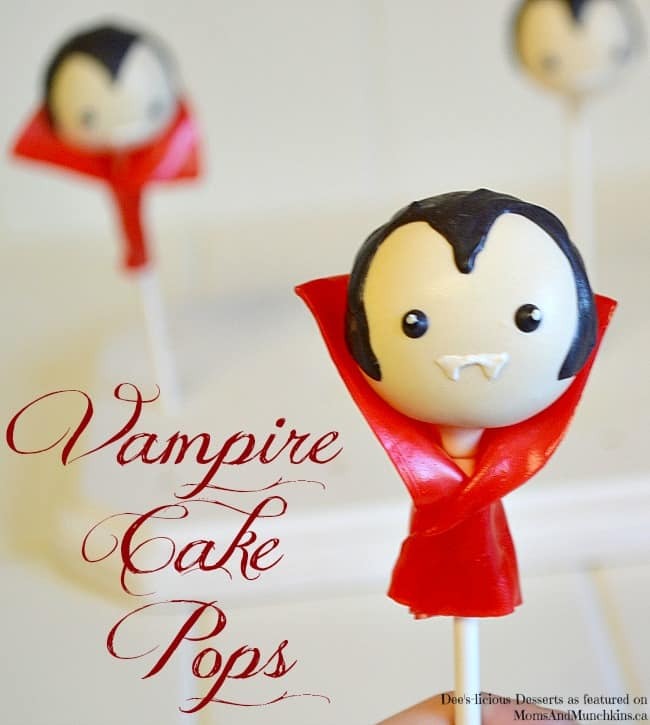 Well, sure I’ve seen vampire cake pops done before, but what about a cape? It didn’t take me long to figure out that I could do just that with some yummy fruit roll ups! These are too cute for words, and so simple to recreate. They are sure to be a hit at your next Halloween party! 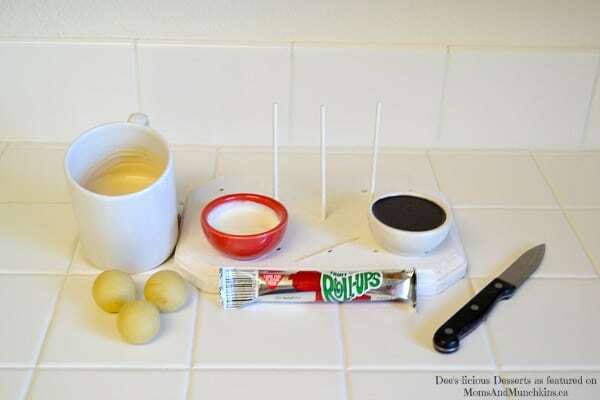 Dip your cake pop stick into the melted tan chocolate and push it into the cake pop ball. Stick these into your stand and let dry completely. Doing this helps prevent the cake ball from sliding off when you dip it in chocolate. 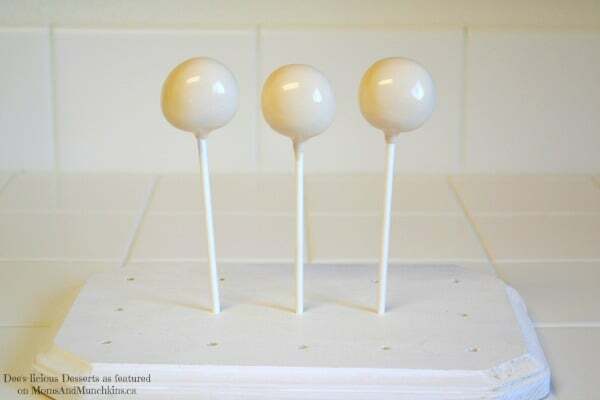 Carefully dip your cake pop into the tan chocolate. Gently tap off any extra chocolate. 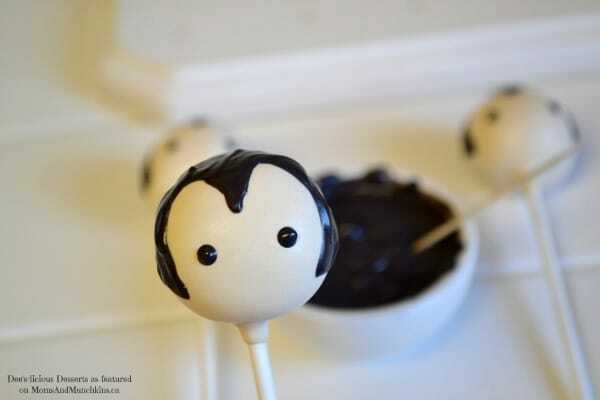 Place back into your cake pop stand and let that chocolate set. 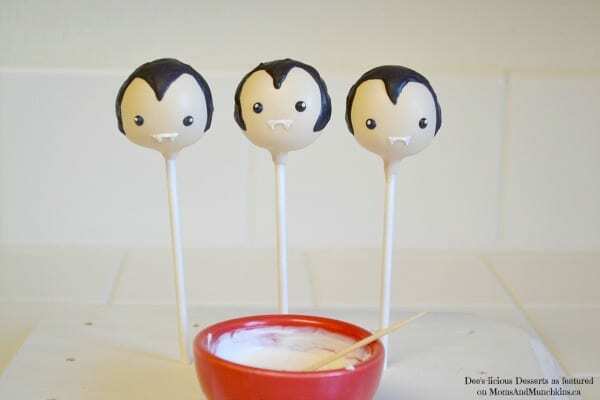 Take your toothpick and, with a generous amount of black chocolate, draw on the vampires hair. Tip – lightly scratch an outline of where you want the hair to go with your toothpick. Repeat hair on all your little hairless vampires. Let dry. Next, using your toothpick again dip the very end into the black chocolate, and give that vamp some eyes. 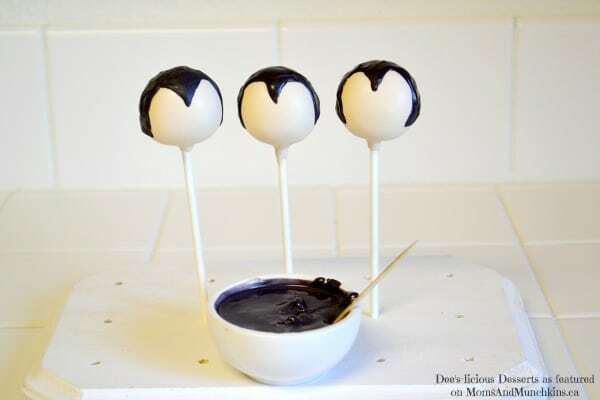 It’s easier to achieve round eyes if you twist your toothpick into the chocolate to create somewhat of a ball of chocolate at the tip and then placing that ball of chocolate right onto the cake pop. That way you don’t have to attempt drawing out a perfect circle with your toothpick. Once those eyes are set dip the very tip of your tooth pick into the white and put a very small dot of white onto the black eyes. I placed mine in the top outer part of the eye. Using the white chocolate again make a mouth. A straight line will work just fine. Add a couple fangs and then put those pops back in their stand. 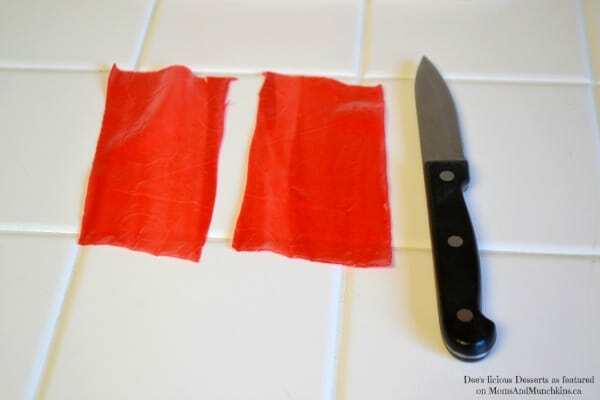 Now, open up your fruit roll up and unroll it. Using your knife, cut it in half. 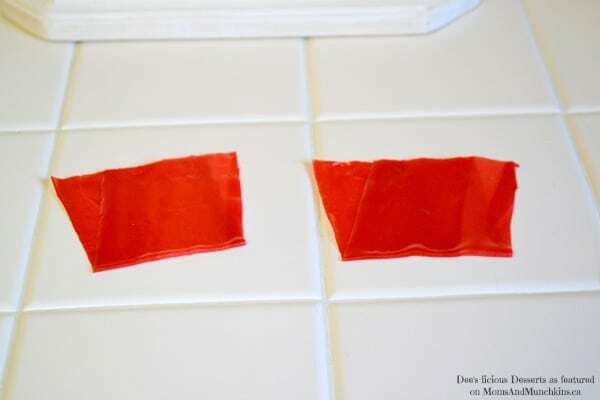 Carefully fold your half piece of fruit roll up while lining up the edges. This will make the folded end a bit smaller, which is what you want. Folded end up, center your vampire on the fruit roll up. Twist the bottom of the roll up around the stick and pinch the back of it so that it stays in place. After a few minutes of working with the roll up it gets a bit sticky, so you’ll want to work fast. You shouldn’t need anything to adhere the roll up to the cake pop stick if you pinch the roll up together, around the stick. It will cling to itself. 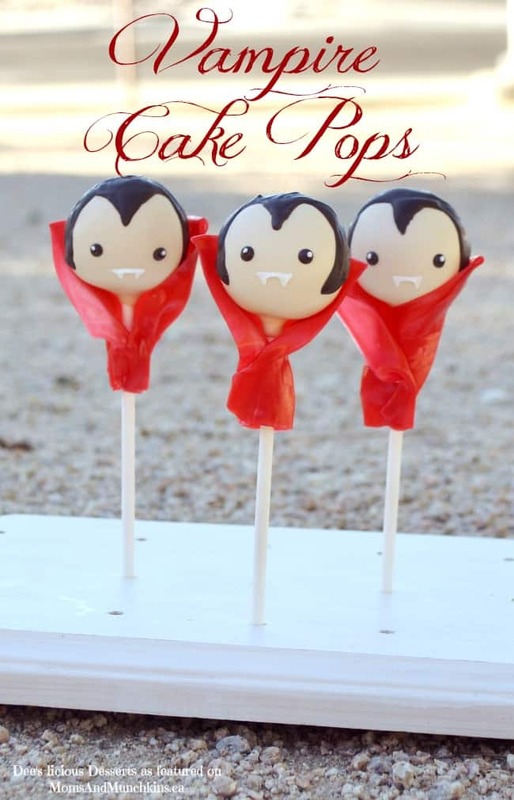 And there you have it, some super cute vampire cake pops, cape and all! Thank you to Deanna for sharing this spooktacular tutorial with us. To see more of Deanna’s delicious creations, visit her Dee’s-licious Desserts page on Facebook. She makes and ships cake pops as well! Visit our Halloween Fun page for even more ideas for Halloween. Stay updated on the latest ideas by following us on Facebook, Twitter, Pinterest, Google + and Bloglovin’. These are BEYOND adorable! Pinning to a couple of boards. Thanks for linking up to the DIY Inspired Link Party! Thank you so much, Jillian! Deanna is a cake pop expert! These are adorable little vampires! Featured you on Mom’s Library this week! 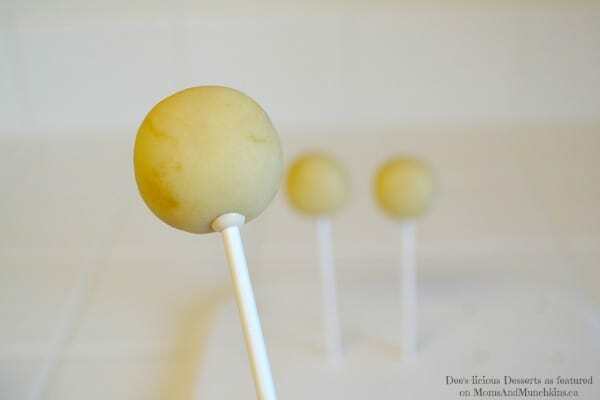 Yes, Deanna has such a gift when it comes to cake pop designs! !! I love this, simple and adorable. I will make this for halloween. How much do these make ??????? Hi there! It depends what size of cake you crumble to make into cake pops. If using a boxed cake mix, you’ll probably get 25-30 cake pops out of it.